Firebomb thrown at two Israeli Chabad yeshiva students on visit to Manhattan. Two Israeli yeshiva students were attacked with a firebomb while on a visit to New York City on Friday afternoon, COLlive.com reported. Yisroel and Yosef, 19, were walking on 37th Street near Ninth Avenue when one felt "an agitation." The victims, of the Chabad sect, asked that their surnames not be mentioned. 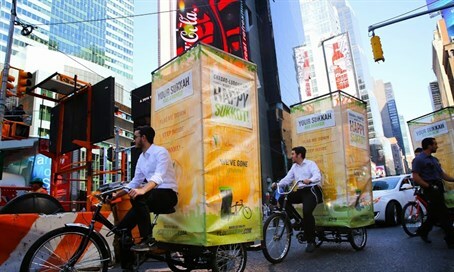 The two had taken the subway from Brooklyn into Manhattan to participate in the mitzvah cycles initiative, in which Chabad yeshiva students help Jewish business owners and their clients perform good deeds and Jewish commandments. "A firebomb was thrown at them," said a brother of one of the victims. "It exploded and there was fire. They were shocked. An Israeli woman was walking by and ran over to check if they were okay." "Thank G-d, it missed them and landed on the pavement," he added. "It was a male that threw it at them but they only got to see his back because he ran away. They didn't hear him shout or say anything." According to COLlive.com, this is the first reported attack on Jews or Israelis in New York City since the recent uptick of Arab violence against Jews in Israel. However, several anti-Semitic incidents were reported in New York in September throughout the Jewish High Holidays, including two separate BB gun attacks on two Orthodox Jewish men in Kew Gardens Hills in Queens. In response to the firebomb attack, the New York Police Department heightened security in Jewish neighborhoods throughout the city.